Leinster have been crowned Ireland's Interprovincial champions this season after a draw with Munser was enough to secure the title on points difference. The teams played out a 14-14 draw at Donnybrook under the lights. Both sides finished the campaign with two wins and a draw but, with the roles reversed from last year, Leinster secured the silverware thanks to their superior scoring difference (+64 compared to Munster's +37). Munster almost pulled off a win however the conversion of Rachel Allen-Connolly's levelling 80th-minute try was agonisingly missed by Niamh Briggs. Leinster out-half Nikki Caughey led Briggs 9-6 in their kicking duel at half-time, with the former Ireland captain opting to go for the corner when Munster got on top early in the second half. Laura Guest's charges were struggling to breach the home defence and Briggs' third successful penalty in the 63rd minute levelled matters. That left enough time for the late drama with Linda Djougang hauled down within inches of the line before Leinster reset and touched down out wide through flanker Juliet Short with her fourth try of the Championship. Munster's siege was successful in the dying minutes with out-half Allen-Connolly capitalising on an overlap to notch the only try Leinster have conceded in the tournament. 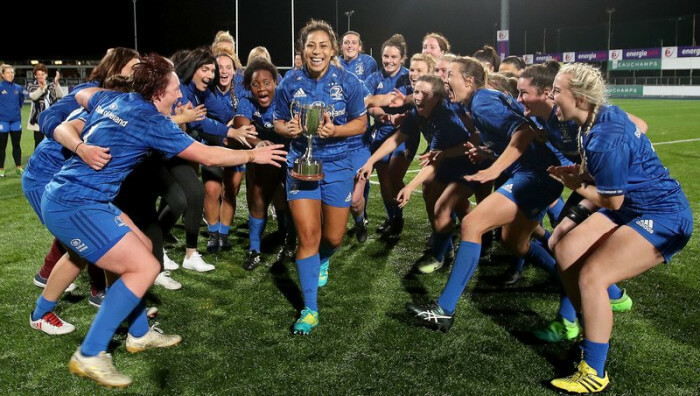 The joy and agony was obvious when Briggs' right-sided conversion, with the destination of the title riding on it, narrowly missed the target, leaving the Leinster Women to collect the trophy in coach Ben Armstrong and captain Sene Naoupu's first season at the helm. Connacht secured third place with a 31-17 bonus point win at home to Ulster, the tries being shared out by Catherine Martin, Mairead Coyne, Amelie Roux, Ciara O'Connor and Anee-Marie O'Hora. Meanwhile, Ballinasloe starlet Beibhinn Parsons' hat-trick of tries saw Connacht edged out Leinster 21-19 to win the IRFU Under-18 Women's Interprovincial crown for the first time. A Home Nations Sevens Series with the Ireland U-18s in July, centre Parsons' best of the lot at Parsonstown yesterday saw her counter attack from under her own posts and cover the length of the pitch. The final round victory completed a unique double for Connacht Rugby who now hold Interprovincial titles in both the Men's and Women's U-18 grades. "It means so much," said Connacht U-18 Women's head coach Fraser Gow. "Leinster are a very good side. We've had a lot of tough days over the last couple of years. That result and the series win is for everybody who has contributed. "The Ulster U-18s defeated outgoing champions Munster with a 31-5 bonus point success in the opening game at MU Barnhall RFC. Charlie Farrell's side led 19-0 at half-time and finished with a five-try haul - Lucy Turkington, Aoife Cahill, Lisa Mullen (2) and replacement India Daley all touched down.